Today, in honour of the Christmas season, I’m republishing a piece which I wrote in English and in French (separately) and which first appeared in the now sadly defunct French Living Magazine several years ago. It’s about the Christmases of my childhood, which were always wonderful and set me up with a lifelong love of this beautiful season. I’m republishing the piece both in its English and French versions. And at the very end, there’s a recipe for the very simple and delicious Christmas log(Bûche de Noël) I describe my mother making, and which has stayed in our family as a staple of the Christmas table. Merry Christmas, season’s greetings, and a happy New Year to all my readers! 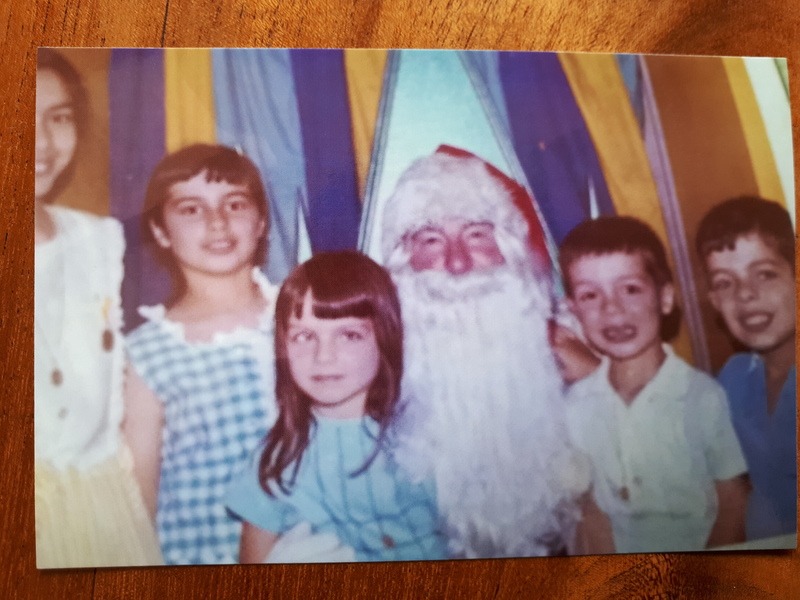 Seeing Santa in David Jones, in childhood. 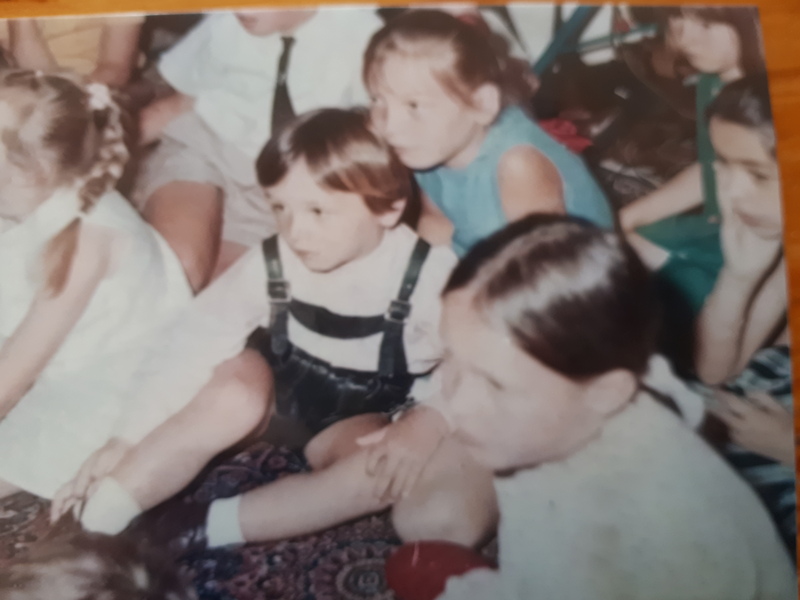 I am at very edge on left, in yellow dress, Camile standing next to me, Gabrielle and Bertrand on Santa’s lap, and Louis at far right. Christmas! Even the letters of the word to me glitter like the candles that shone on the festive tables of my childhood. My parents arranged our lives to the rhythm of traditional festivals: Easter, Mardi Gras, the Assumption, All Saints: but Christmas was by far the most important festival in our family. 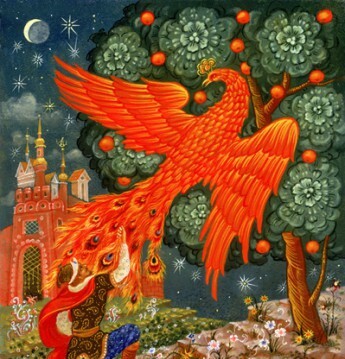 It was an enchanting time, a time when fairytales and religious stories seemed to come together in a warm and joyful atmosphere. In Australia as in France, our parents gave us Christmases both extraordinary and traditional; something that later, as a mother myself, I took enormous pleasure in continuing. Some things my husband and I changed; we didn’t do the ‘réveillon’, for example—but the memory of wonderful childhood Christmases was something I was determined to give our children. As a child, I would wait for Christmas in a kind of dreamy impatience; every year it was the same and every year I would wait for each predictable yet surprising stage of the great festival. In Sydney, that would start the week before Christmas, on a Saturday, when my father would take my sister Camille and I to David Jones in the city. (We also went with Maman to see Santa with the little ones during the week). First we looked in delight at the beautiful windows with their traditionally festive themes; then we would go onside the shop to choose the beautiful dress that would be one of our presents—the only one not from Father Christmas. Usually, it was with my mother that we went shopping, but here it was my father who enjoyed taking us with him. (Later, our brothers and little sister were taken too before it all ended when we were teenagers.) Lace, ribbons, fine lawns, velvets, vivid colours, it would all be paraded before us then, once the dress was chosen(my father of course had the last word!) we went to the store’s restaurant for lunch, an unusual treat! In Sydney, my father worked for a big French construction firm, and several years running, the company director and his wife threw a Christmas party at their gorgeous harbourside home in Point Piper for the children of employees, the week before Christmas. They stopped doing that when I was around 9 (no doubt because of the large expense involved! ), but they were wonderful parties. Not only was there a huge and delicious afternoon tea, a gigantic Christmas tree, exciting games with great prizes, and a Disney film to watch in the home theatre, but happiness of happiness, each child had been allowed to request from Father Christmas whatever he or she wanted. One year stood out for me in particular: I’d asked for a bride doll; my younger sister Camille a baby doll. Alas! When she set eyes on my doll, resplendent in her white lace, she was furiously jealous, grabbed it out of my hands and decapitated it, from sheer spite! My beautiful doll Isabelle had to spend Christmas headless and had to go quickly to the doll hospital at New Year..
Christmas time at home was magical. A day before Christmas, the tree arrived at our place. That evening, my father decorated the tree and the eldest children were allowed to hand him the precious decorations: the fragile glass baubles, wooden figures, tin soldiers, silk birds, strings of glass beads and tinsel; the younger children could look but not touch. Once the tree was loaded with its lovely shining burden, we would stay there looking at it in wonder; hardly even hearing Maman telling us to each get a pair of shoes to put under the tree, ready for Father Christmas the next day. But if that day was interesting, the next day was the one we really waited impatiently for. For that day would be the day of presents, and of the réveillon, certain years; we didn’t do the réveillon every year(it depended on how tired our parents felt!) but it is that memory I want to evoke now. All day, Maman would cook the food for the réveillon meal, and we would help her, or rather, we buzzed around getting in the way. If we were at Sydney rather than France for Christmas(which was more than often the case), Maman would adapt traditional dishes for a summer rather than a winter Christmas. She avoided heating up a house that was already hot with dishes that needed too long in the oven: so, no roast turkey or geese for example but a beef roast cooked rare or other such meat(the main dish varied from year to year)and no hot starters either, but good fresh seafood, oysters, mussels, prawns, crayfish. And though we always had a Christmas log cake, it was a little different from such cakes traditionally served in France; this one was not even cooked but made with crushed sponge finger biscuits, mixed with melted butter, a little sugar, an egg and hot strong coffee, shaped into a log, put in the fridge to set then later covered with melted chocolate and out back into the fridge till it was time to serve it. This antipodean Christmas log has also figured in my children’s Christmases, as I have kept up the practical and delicious tradition of my mother. So, Christmas Eve went by in cooking and for us children in airing feverish theories as to what we’d find near our shoes under the Christmas tree, in a few hours. As to me, who clung fervently to belief in Father Christmas and in fairies too till the age of 11 or 12, I worried that Father Christmas might forget us or might get sick or have an accident in a sky that was so full of planes already! I was determined I wouldn’t go to sleep but would await his arrival that night; but every time, it was the same thing. We children would be in bed by six o’clock that evening; first, I’d not be able to close my eyes; then half past eleven would come, when our parents woke us up to go to midnight mass, and I’d always be surprised to discover I’d been fast asleep. We were allowed, before going to Mass, to have a peek in the living room where the glittering tree, smelling warmly of the forest, reigned, with, at its foot, a pile of presents. No way were we allowed to open them before mass; but what joy to see them there, and what exquisite torture was the wait! Outside, it was dark, for it was midnight, but the church was full of light, the choir was singing joyful carols, baby Jesus smiled between his proud parents, and soon it would be the time for us to open our presents and to eat the magnificent meal Maman had prepared, which in the light of the candles looked like a royal feast. It was Christmas, really Christmas, a day we preferred even to our own birthdays–for not only did it last longer, but everyone seemed filled with a joyful spirit and all that was ordinary and humdrum and boring disappeared in a beautiful, warm and unforgettable enchantment. Watching a film at the company children’s Christmas party, aged about 7. I am at far right at edge of pic, chin in hand, blue dress. Noël! Les lettres même de ce mot brillent pour moi sur la page, comme les bougies qui brillaient sur la table de fête de mon enfance. Mes parents ont fait vivre notre enfance aux rythmes des fêtes traditionelles; de Pâques, de Mardi Gras, de l’Assomption, de la Toussaint, mais Noël etait de loin la plus importante fête dans notre famille. C’était une période d’enchantement, un moment où le conte de fées et l’histoire sainte se réunissaient merveilleusement dans une ambiance chaleureuse et joyeuse. En Australie comme en France, nos parents nous ont offert des Noëls à la fois extraordinaires et traditionnels; chose que plus tard, mère moi-meme, j’ai pris énormement de plaisir à continuer. Certaines choses mon mari et moi ont changé; nous ne faisons pas le réveillon, par exemple; mais le souvenir de Noëls enfantins merveilleux est quelque chose que je tenais absolument à donner à nos enfants. Enfant, j’attendais Noël avec une sorte d’impatience rêveuse; tous les ans c’était la même chose et tous les ans j’attendais les étapes prévisibles mais surprenantes de la grande fête. A Sydney, ça commencait le samedi avant Noël quand notre père nous amenaient, ma soeur Camille et moi, chez David Jones, à ‘la city’. (Nous allions avec Maman aussi avec les petits pendant la semaine voir le Père Noël) Nous nous extasions devant les belles vitrines avec leurs thèmes traditionnels de fêtes et puis nous rentrions dans le grand magasin pour choisir les belles tenues que nos parents nous offraient chaque année —le seul cadeau que nous savions n’était pas apporté par le Père Noël. D’habitude, c’était avec notre mère que nous allions faire les magasins—mais là c’était mon père qui se faisait une joie de nous accompagner. (Plus tard, les garçons et ma petite soeur y sont allés aussi.) Dentelles, rubans, tissus fins, velours, couleurs chatoyantes: tout le matin ça défilait devant nous et puis une fois la robe choisie(mon père ayant bien sûr le dernier mot! ), nous déjeunions au restaurant du magasin, chose exceptionelle! Le sapin de Noël lui-même avait déjà été commandé, mais n’arriverait à la maison que deux jours avant le grand jour; mais il fallait quand même sortir auparavant les boites pleines de décorations: des boulles en cristal, d’étoiles en satin, de petits bonhommes en bois, de petits oiseaux au plumage en soie et aux yeux faits de sequins, etc, pour être bien sur qu’il n’y avait rien de cassé. Là encore c’était mon père qui était maitre de cérémonie—nous avions le droit de regarder( avec nos yeux bien ronds!) mais pas de toucher. Mais nous avions le droit de lui passer, si nous faisions trés attention, les ravissants personnages en argile pour la crèche. Mon père travaillait pour une grande compagnie française de construction, et plusieurs années, le directeur de la compagnie a offert une fête pour tous les enfants d’employés, la semaine avant Noël; cela a cessé quand j’étais encotre trés jeune, vers 8 ans, et je m’en souviens que d’une de ces fêtes somptueuses, et cela à cause d’un évenement particulier. Non seulement y a t’il eu un goûter merveilleux, un arbre de Noël gigantesque, des jeux passionants, et un film de Mickey a visionner, mais comble de bonheur, chaque enfant avait pu demander au Père Noël ce qu’il ou elle voulait (c’était la compagnie qui payait).J’avais demandé une poupée habillée en robe de mariée; ma soeur Camille une poupée-bébé. Hélas! Quand elle a vu la mienne, superbe dans sa robe en dentelle blanche, elle est devenue jalouse furieuse, s’en est emparée et l’a decapitée, de pur depit! Ma belle poupée a du passer Noël sans tête et aller dare-dare à l’hopital des poupées au Nouvel An..
Mais la plupart de temps dans mon enfance, il n y avait pas de fête de Noël hors de la maison. Un jour avant la veille de Noël, le sapin arrivait chez nous. Ce soir-la, mon père décorait l’arbre et là encore les plus grands avaient le droit de lui passer les précieux bibelots; les plus petits pouvaient regarder mais surtout pas toucher! Une fois le sapin chargé de son beau fardeau étincelant, nous restions là tous à le regarder avec émerveillement; n’entendant presque pas Maman qui nous appelait pour venir chercher une paire de chaussures chacun pour mettre sous l’arbre, prêts pour le Pere Noël le lendemain. Mais si ce jour la etait passionant, le lendemain, la veille de Noël , était le jour qu’on attendait avec le plus d’impatience. Car ce jour là était le jour des cadeaux, et du réveillon, certaines années. On ne faisait pas toujours le réveillon; ça dependait de l’année(et de la fatigue de nos parents! ), mais c’est celui-la que je vais évoquer maintenant. Toute la journée, Maman faisait la cuisine pour le repas du réveillon, et nous l’aidions, ou plutot, nous nous empressions de jouer à la mouche du coche. Si on était à Sydney pour Noël (ce qui était le plus souvent le cas) Maman adaptait les plats traditionnels pour un Noël estival plutot qu’hivernal. Elle évitait de chauffer la maison déjà assez chaude avec des plats qui doivent aller trop longtemps au four: donc pas de dinde ou d’oie rotie par exemple, mais un rôti de boeuf cuit trés vite ou autre viande rapidement cuite(le plat principal changeait tous les ans)pas d’entrées chaudes, mais des bons produits de la mer tous frais, huitres, moules, crevettes, langoustines. Et quoique nous avions toujours une Bûche de Noël elle etait un peu différente des bûches traditionellement servies sur les tables de Noël françaises; celle-ci ne se cuit même pas, mais est faite de biscuits à la cuillère reduits en poudre, mélangés avec du beurre fondu, du sucre, un oeuf et du café fort, le mélange arrangé en forme de bûche, mis au frigo, puis plus tard recouvert de chocolat fondu et remis au frigo jusqu’au dessert du réveillon. Cette Bûche facon australe a fait partie aussi de tous les Noëls de mes enfants, car j’ai gardé cette tradition pratique et delicieuse de ma mère. Donc, la journée de la veille de Noël se passait en cuisine et pour nous enfants en tout cas en théories fièvreuses sur ce qu’on trouverait prés de nos chaussures dans quelques heures. Quant à moi, qui a cru fermement au Père Noël,comme aux fées, d’ailleurs, jusqu’a l’âge d’onze ou douze ans, je me faisais du souci au cas où le Père Noël nous oublierait, ou tomberait malade, ou aurait un accident, car, me disais-je, il y a déjà tellement d’avions qui sillonnent les cieux..Je me disais que je ne m’endormirais pas, ce soir là, que j’attendrais son arrivée; mais chaque fois, c’était la même chose. Nous, les enfants, étaient au lit à six heures du soir; d’abord je n’arrivais pas à fermer les yeux; mais arrivé onze heures et demie du soir, quand nos parents nous reveillaient pour aller à la messe de minuit, j’etais toujours surprise de decouvrir qu’en fait j’avais bel et bien dormi! Nous avions droit, avant de partir à la messe, de jeter un coup d’oeil dans le salon ou le sapin, étincelant de bougies, de cristal et de guirlandes, et sentant bon la forêt, tronait magnifiquement avec, à ses pieds, un déversement ruisselant de cadeaux. Pas de question de les ouvrir avant la messe; mais quelle joie de les voir là, et quelle douce tourmente, l’attente! Dehors, il faisait noir, car il était presque minuit, mais l’église etait pleine de lumière, le choeur chantait des cantiques joyeux, le petit Jesus souriait entre ses parents ravis, et puis bientôt ce serait le temps ou on pourrait ouvrir nos cadeaux et manger le magnifique repas que Maman avait preparé et qui, dans la lumière des bougies, ressemblait à des festins de cour royale. C’etait Noël, vraiment Noël ; un jour que nous préférions même à nos propres anniversaires—car non seulement durait-il plus longtemps, mais tout le monde semblait rempli de joie de vivre et tout ce qui était ordinaire et ennuyeux avait disparu pour le moment dans une féerie ravissante, chaleureuse et inoubliable. Super easy Christmas log (needs no baking, can be made Christmas Eve). As noted above, this was my mother’s invention, we had it every Christmas when we were kids, and I still make it every Christmas. Cooking chocolate, melted with a little cream. Crush all the biscuits, add the hot sweet coffee, the melted butter, and mix well. Add the slightly beaten egg(or two). You need to obtain a good stiff mix that you can easily shape into a log. That’s what you do then–shape it into a log, and then put it in fridge till it is set. Meanwhile melt the chocolate over a low heat with a little cream, stir till all melted and glossy. Spread over the cake, on the top and sides. Put in fridge to set overnight. 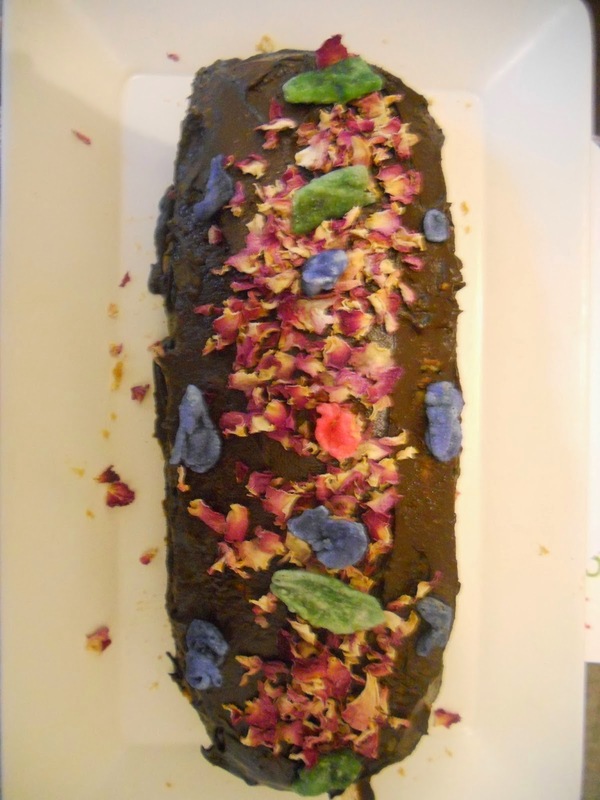 You can also decorate the top with angelica leaves, almonds, sugar holly, whatever you feel like!